Sometimes when you look at a seemingly ubiquitous charity behemoth like the American Cancer Society, you find that there’s so much more to know than you realized. The ACS, founded 105 years ago by ten doctors and five laypeople in New York City, has perhaps had the biggest impact on cancer research and the advance of treatments of any single entity except the US government. At the time of its founding in 1913, a cancer diagnosis was a near-certain death sentence. Over time, the American Cancer Society has contributed to a 26 percent drop in the overall cancer death rate in the US, which translates to 2.4 million fewer cancer deaths between 1991 and 2014. Driven by a new mission expression of “attacking cancer from all angles,” the American Cancer Society is tackling this family of diseases with renewed fervor. The four angles – research, mission programming, awareness and education, and advocacy – provide for national and local approaches for saving lives and improving the quality of life for survivors and those undergoing treatment. Outside of the federal government, the American Cancer Society is the top funder of cancer research, with more than $4.6 billion already invested. Since its humble beginnings in New York City, the ACS has already seen 47 of its researchers earn Nobel Prizes, due largely to the organization’s philosophy of identifying talented researchers early in their careers to support new ideas. The American Cancer Society provides a variety of services at no cost to cancer patients. These services include the organization’s Hope Lodge program, where patients and caregivers receive free lodging in more than 30 locations across the country, an initiative to make families more comfortable when they go out of town for treatment. For those areas without Hope Lodge facilities, the ACS partners with major hotel chains to provide free or discounted stays for eligible patients and caregivers. The organization, as with many services, relies on hospital and clinic social workers to identify those in need of lodging. In addition to lodging, the American Cancer Society has provided more than 8.5 million rides for patients to make medical appointments and treatments through its Road to Recovery program. For more than a century, the ACS has been recognized as the leader in cancer awareness and education, through direct-to-consumer initiatives that educate the public about the links between tobacco and cancer, as well as promoting healthy living. The organization has also contributed to more than 800,000 cancer screenings in underserved communities, catching cancer earlier and increasing life expectancy for many who may have died due to lack of proper care. In addition to public education, the ACS’s advocacy affiliate, the American Cancer Society Cancer Action Network (ACSCAN for short), works daily in the halls of government to ensure officials have the latest research and field knowledge needed to continue the US government’s leadership in fighting cancer and funding research. Currently, the American Cancer Society is leading a massive educational campaign for reducing HPV-related cancers. The campaign – Mission: HPV Cancer Free – aims to increase the national HPV vaccination rate to 80 percent by 2026. The HPV vaccine is a safe and effective vaccination that protects against six different forms of cancer caused by the human papillomavirus when administered to boys and girls in the ideal age range of 11-13. The ACS is excited to join the GoodBookey platform, as an organization that has always been innovative in its fundraising efforts, particularly in the world of sports. Since all of its services are free to patients and their families, creating fun ways to engage with the organization are quite important. Currently, the organization is collaborating with the NHL for Hockey Fights Cancer, the NFL’s Crucial Catch Program, and Coaches vs. Cancer, which has expanded from college basketball to include all youth and high school sports. GoodBookey is very proud to have the American Cancer Society, serving patients and families, as well as leading the race to find more effective treatments for every kind of cancer, as one of our charity fundraising partners. For more information on the high-impact work of the American Cancer Society, please visit their website! 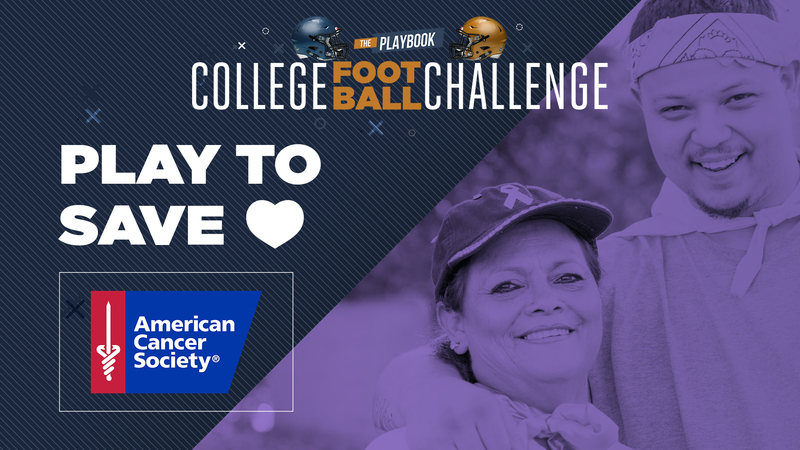 If you’re looking for ways to contribute, head over to the GoodBookey app for this week’s College Football Challenge where all proceeds are going straight to the American Cancer Society. Join us and play to save!